We've all heard of them. They are the "writing" rules that we, as newbie writers, need to pay attention to and follow. They are taught at writing conferences, preached in craft of writing books, scribbled in the margins of a critique, and typed in the notes of a contest judge. But, we've also heard all the moaning about the rules. They stifle our creativity. They inhibit our voice. They are ignored by famous published authors, so why do we have to follow them? And who in the world makes these "rules" anyway? All of these are valid questions. And *ahem* I'll attempt to answer them today. Beware though: You may not like the answers! Myth #1: They stifle our creativity. The rules shouldn't stifle you. If they do, something is wrong. In your creative mode, the rules should be in the back of your mind. Your first draft is totally allowed to break them. Get the story down. The editing stage is when you should REALLY start looking to see what works and what doesn't. Did telling make a scene boring? Can your writing be tighter if you resist the urge to explain? Do you have five was's in a row that make you writing sound weak? Find those things in the EDIT stage, not the WRITING stage. Myth #2: They inhibit our voice. This is a half-truth. If you let the rules direct you during the writing stage, your voice may be tampered. If you care more about pleasing a contest judge and less about writing a riveting, compelling story, then your voice might croak a little. Again, the answer is this: Write using your voice, edit using rules. Myth #3: They are ignored by famous writers. Why can established and famous writers break the "rules" and we can't? Well, there are a few reason for that. These writers already have a proven audience who are used to the "old" way. Writing "rules" change and develop. Many of these writers started writing BEFORE we knew what head-hopping was. Readers don't know what rules are. They just know if they like the story. Myth #4: No one knows who makes the rules. Easy answer: Readers and Editors. Readers know what they like to read. Editors make it their job to know what pleases readers and what will sell. Eventually, the trends trickle down to us writers in the form of what we call rules. So, here's the other thing. There is NO SUCH THING as a writing rule. 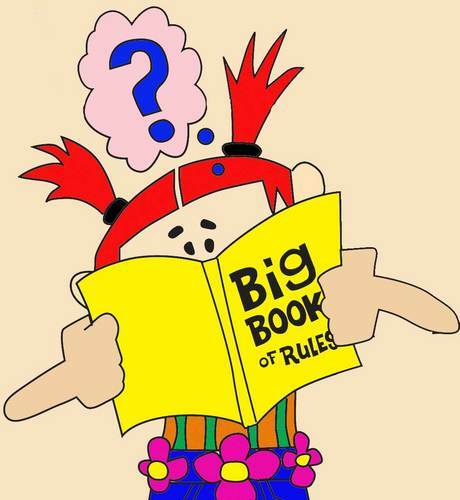 There is no big writing rule book that must be followed. 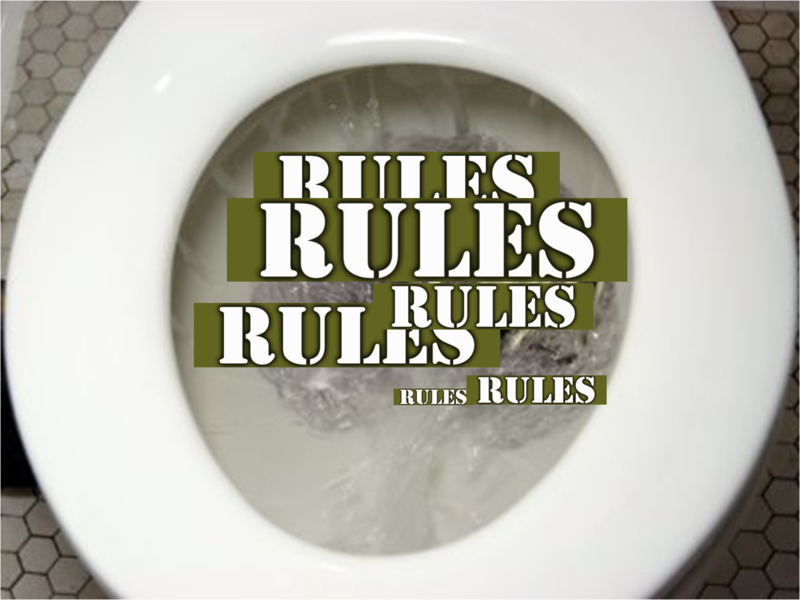 In fact, I've heard several people say, "The only rule is that there are no rules" and I totally agree! They are, in fact, guidelines. Things to keep in mind while writing. Take every rule you hear and do this. When you see the word "Always" replace it with "Usually." When you see the word "Never" replace it with "Sparingly." When you see a command, add "Most of the time, you need to ____" at the beginning. There is always a but, isn't there? I've seen many writers (including myself) use the fact that these are "guidelines" as an excuse for bad writing, which is a big no-no! The way to combat this is with a GOOD editor and/or with GOOD critique partners, ones who understand that the rules are guidelines and won't ding you for each and every was, won't ask you to "show and not tell" in every single spot even when it would be *yawn* worthy to "show", but will honestly tell you when things just aren't working or when you've colored too far out of the lines. These partners won't tickle your ear with unnecessary praises, but will give you honest, balanced feedback, both the good and the bad. I'm curious. What is the one rule you have the HARDEST time following? Conversely, what is the one rule that is easy for you? The easiest is no head-hopping. I am very linear and analytical, so staying in one POV is very comfortable to me, and I can usual spot a POV slip a mile away when critiquing a novel. Easiest? I have no idea. Does avoiding bad grammar count? Like Meg, I'm an info dumper. I don't have the balance down, because I've written without the dump, which just confused my first readers. Sigh...what a balance. I also hate the rule about no ly words. I love ly words. They can express things in a shorter phrase. I don't get why you have to write MORE to convey the same thing. I've got lots to learn, but hopefully someday the rules will become more natural. The first MAJOR lesson I learned was no head-hopping. Bless my teacher's pea-pickin' heart..he hammered and hammered that into my head. Good news..I've learned...I'm reformed...I've changed! The second MAJOR lesson I learned was "no repeatin' of the words". I played a CD of a class Andy from Christian Writer's Guild presented on this very issue to my teen daughter. Now we can catch each other's mistakes by simply shouting..Andyism! I think my first five or so years of learning the craft in preparation for seeking publication would have been a lot less stressful if I hadn't knocked myself out to "follow the rules" (and because *I* had to follow them, all of those people whose contest entries I judged in those years had to follow them, too, or they'd be hearing from me about it!). I finally realized after all those years that, yes, following the guidelines of strong writing is important, but it's even more important to tell a good, compelling, interesting story. After all, how many books have I lost myself in when reading that are rife with "rules breaking"? Why did I lose myself in them? Because the STORY was fantastic. 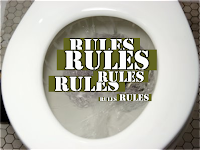 With every manuscript I've finished, "following the rules" on the first draft becomes more and more a part of my natural way of constructing my prose, and that came through revision after revision after revision of previous manuscripts. I may have "learned" the rules at conferences and in graduate school, but I began to understand and absorb the *concepts* once I started putting them into practice in revisions. Kaye, you are making me want to quit procrastinating about doing my editing! You are soooo right, though, and all the rules become second nature as we use them in those revisions...repeatedly. Over and over. What encouraging words. I find I 'break' fewer rules the more I write. Don't get me wrong. I still break and bend a plenty (as you well know), but it's not as much as it used to be. Like taking a loooonger path, not a wrong one. Now Pepper, I am not just Amening YOUR first chapter revisions. I like to spread the love. You know everything is BIG down her' in Texas. We gotta share what we got! "I also hate the rule about no ly words. I love ly words. They can express things in a shorter phrase. I don't get why you have to write MORE to convey the same thing." This rule made me twitch until I ran across someone's personal rules, in which she said that all description is really just opinion. When I describe a woman as lovely, I'm telling the reader what to think instead of letting them see her and think for themselves. When I say a plan went smoothly, I'm giving them a quick summary and not letting them see it work for themselves. I saw how I could use description to create a stronger POV in some cases, and how I was using it to cheat my way out of describing scenes in earnest elsewhere. -ly words keep the reader at surface level, and while they aren't *bad*, eliminating them with strong nouns and verbs create a much better visual for the reader. "She walked quickly into the room." or "She marched into the room." Marched goes deeper description of her gate and lets us know more than just speed. And SHerrinda, there we actually SAVED a word! WOOHOO! Since I am late responding to comments, I won't respond to each one, but you all had fabulous points! Thanks SO much for sharing! In a week, we are going to have another *themed* week where each of the shopkeepers will take on a "rule" and give their thoughts. Guess which one Sherrinda picked?!? HEHE! Yep, I picked the -ly word rule. I really don't like the rule, but after Mokie's explanation, it sure makes more sense.